I made a cake for a colleague’s birthday this week. 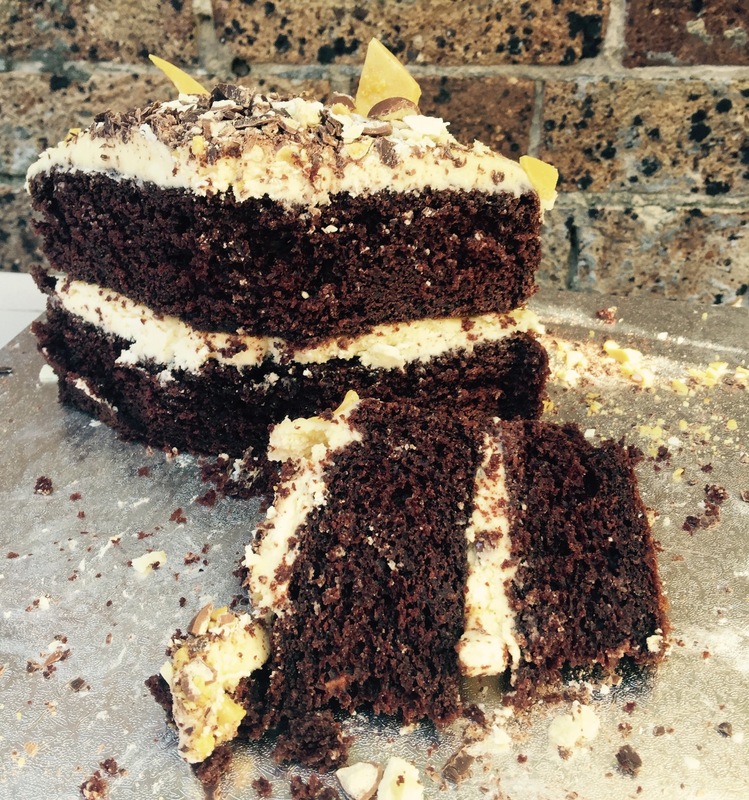 She likes chocolate, and I like honeycomb, so I created a cake combining the flavours. Chocolate layers, with a meringue and honeycomb buttercream, and lots of chocolate, chocolate Maltesers and honeycomb shards to decorate. The cake is really easy – a one bowl cake, which I made in the food processor to make it even simpler. The meringue buttercream takes a little time, but is worth the effort. And honeycomb is so quick to make, there’s no excuse to buy it! Preheat the oven to 160 degrees C. Grease two 20cm round cake tins with butter and line the bases with baking paper. Put all the ingredients in a food processor and blitz until just combined and the mix is smooth. Be careful not to overmix as this will toughen the cake. Pour the batter into the prepared cake tins and smooth the tops. Bake for 1 hour or until a skewer inserted into the centre of the cakes comes out clean. Keep both cakes in their tins until they are cool. Carefully turn out on to a wire rack. Mix on medium or medium-high speed while pinching off small pieces of butter and throwing them in. Mix in vanilla. Continue beating for about 5 minutes until the meringue and butter mixture is completely amalgamated and thick. Combine sugar, honey, glucose and 30 mls water in a saucepan. Cook till pale blonde – 150 degrees C, using a cooking thermometer. Pour onto a tray lined with baking paper. When the honeycomb has hardened, break some into chunks and pulverize the rest. Toppings: honeycomb, 50g dark chocolate and 50g white chocolate, a dozen or so Maltesers. To assemble: When the cakes are quite cold, ice the bottom layer with half the meringue buttercream. Sprinkle some crushed honeycomb over the buttercream, as little or as much as you please. Place the second cake on top. Ice the top of the cake with the remaining buttercream. 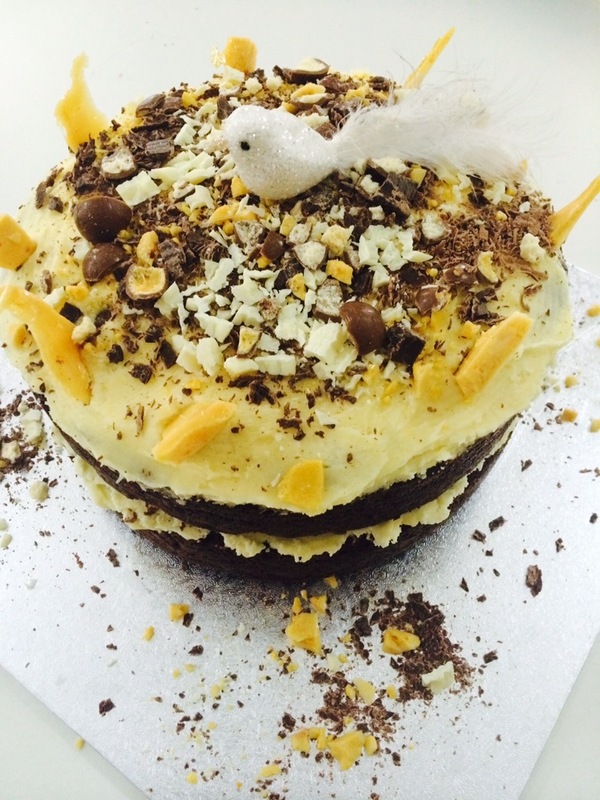 Decorate the cake with crushed honeycomb, dark and white chocolate shavings, crushed Maltesers and honeycomb shards. Posted in Cakes, Dessert, Sweet Food and tagged birthday, celebration, Chocolate Cake, honeycomb, Maltesers, meringue buttercream, yoghurt. Bookmark the permalink.